These methi wali poori were something I made for Diwali feast but somehow forgot to post. They were easy to make and liked by everyone. Since we are methi loving people, these poori are always welcome. 1. In a bowl, mix atta, salt, red chilli powder, ajwain and 2 tbsp oil. Rub flour between your fingers so that oil is evenly spread. 2. Add methi leaves and knead it into stiff dough by adding water. Poori dough should be stiffer than chappati dough. Let the dough rest for 1/2 an hour. 3. Take a small ball (peda) out of the dough and roll it into a 3-4 inch round on a lightly oiled surface. 4. Heat oil in a kadhai/ wok or a deep frying pan. You know the oil is hot enough when a small portion of the dough dropped in kadhai sizzles and rises to the surface. Turn the heat to medium. Poori will be fried on medium heat. 5. Gently slide the rolled puri in the hot oil. Gently press by a pauni (slotted spoon/ chaari). The poori will puff up. Turn over and fry from other side also till golden brown from both sides. Drain by the same slotted spoon on an absorbent paper. 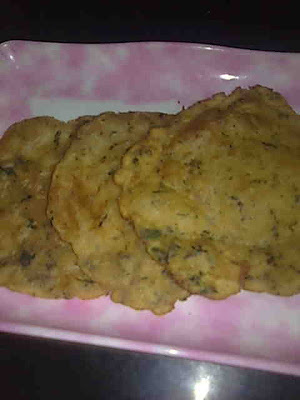 Similarly fry other methi poori from rest of the dough.